Mock-Interviewing is a pre-interview booster, an opportunity to practice interview skills, and to receive constructive feedback in a non-threatening, supportive environment. Students and alumni are invited to schedule a mock interview with Ellen Rodgers, a retired HR professional with over 25 years of experience, on Tuesday, February 19th at the Schaumburg campus. Appointments are limited. Have you ever been confused in Wabash’s Cafeteria on how to properly dispose of your waste? We’re with you! 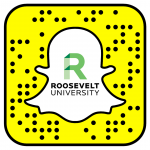 Come to this week’s RU Green meeting on Wednesday, February 20th at 5pm in AUD 526 and learn how to live more sustainably in your life, and help Roosevelt live up to our social justice mission.